His 6’5″, 240 pound stature made him larger than most men; his first game as an Oriole made him larger than life. Roar from 34 recommends starting your day with some Orioles Magic and Thank God I’m a Country Boy. Even after 12 losing seasons, it’s great to be an Orioles fan. The Birds begin the 2010 campaign on the road, which brings to mind one of my favorite Opening Day memories: Sam Horn’s two-homer, six RBI day in Kansas City in 1990 to lead the O’s to a 7-6, 11 inning victory against the Royals. Every O’s starter had a hit, and Jay Aldrich tossed three shutout innings to pick up his only win as an Oriole. Meanwhile, Gregg Olson, fresh off winning Rookie of the Year, earned the first of a career high 37 saves in what would be his only All Star season. But Sam Horn ruled the day. 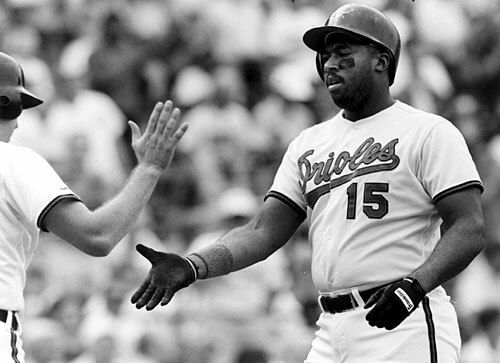 As I’ve noted before on this blog, Sam Horn is one of my all-time favorite Orioles. His 6’5″, 240 pound stature made him larger than most men; his first game as an Oriole made him larger than life. Around this time last season, The Sun’s Mike Klingaman caught up with Horn to reminisce about his big day. In the second inning, with two aboard, Horn poled a fast ball off KC ace Brett Saberhagen, the Cy Young winner, deep into the waterfalls at Royals Stadium. In the eighth, with the Orioles down, 6-3, Horn tagged a curveball off reliever Steve Farr into the bullpen to tie the game. His six RBIs set an club record for Opening Day and drew ooohs from his skipper. The next day, Horn got two more hits, eliciting praise from Royals star George Brett. So the moral of the story is this: They may not be ideal, but road openers can still prove memorable.